If you spend time scanning reviews, you’ll see that this type of feedback is typical. 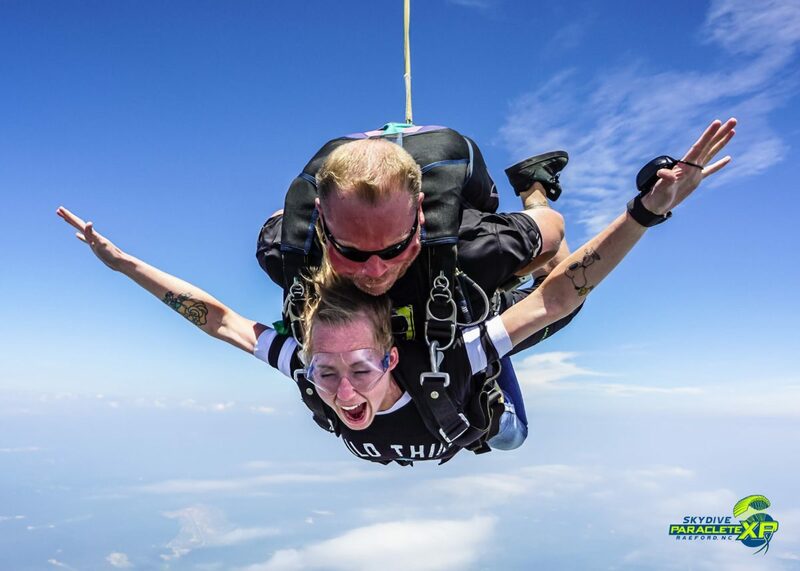 Skydiving is proven to offer a host of positive effects on the body and mind. Skydiving involves a whole lot more than passively falling through the sky. As all solo-skydivers-in-training quickly learn, skydiving requires dexterity, agility, strength and endurance. Throughout the experience, your lower back muscles are activated and your core is engaged. During freefall, you learn to arch your body just-so to maximize your wind resistance and to experiment with body positioning to help you achieve different effects in the sky. While preparing for and during landing, you strategically maneuver as you search for just the right spot to touch down and either slide into home base or literally hit the ground running. For optimal performance, it’s always a good idea to stretch ahead of your jump and take time to cool down afterwards. Working out on the days you’re away from the dropzone is sure to enhance performance as well. Being in good shape not only means that the physical demands of skydiving will be easier but you’re also likely to have more fun. Skydiving is an all-in kind of sport. With safety always being top of mind, skydiving dropzones carefully consider their facilities and equipment and then establish and strictly enforce a few rules. There’s always a weight limit, for example. At Skydive Paraclete XP, tandem jumpers must weigh less than 230 pounds and students less than 250. Gear has to fit correctly; if it doesn’t, you won’t be going up. Between the adrenaline your body will be busy pumping and the lower oxygen rates at altitude make considering your general health important to consider. High blood pressure and skydiving aren’t typically a winning combination and diabetics have to exercise caution. As with any sport, particular health concerns should be addressed with your doctor. There isn’t usually a maximum age, but our national organization, which we are a member, recommends jumpers to be at least 18 years old. The brain gets a workout while skydiving too. In truth, the mental health, emotional and spiritual benefits skydivers enjoy are difficult to achieve in any other way. Chemicals course through the body throughout the experience – while anticipating your jump, when you exit the plane and soar during freefall, once under the quiet of canopy and, of course, after you land. Adrenaline makes you hyper aware of your surroundings, heightens your cognition and propels your energy sky-high. You feel your strength and your power; you’re ready to take on the world. The serotonin you release floods you with positivity, reinforces your significance, and helps you regain perspective. Dopamine is also released during skydiving. A powerful neurotransmitter, dopamine inspires feelings of motivation, exhilaration, enrichment, empowerment, and excitement. This intense chemical cocktail means that you’ll be happy, everyone will know it and your face will most definitely show it. 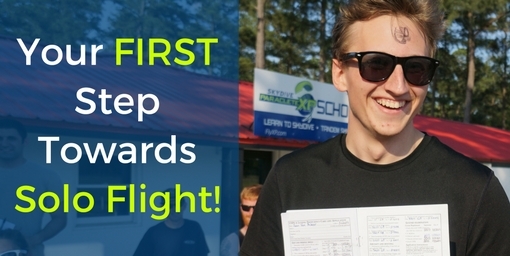 Another benefit of skydiving that first timers might not expect is the huge, welcoming, supportive and supremely happy-go-lucky community that surrounds the sport. In a time when people find lots of reasons to fuss and fight, skydivers insist you check negativity at the door. They don’t care where you fall on the economic scale, who – or if – you worship, the color of your skin, who you voted for, or who you get busy with. Skydivers care about blue skies and big smiles; everything else is secondary. They are enormously passionate and LOVE to share the sport. Finding your home dropzone will also mean joining a family, and make you an immediate member of an enormous extended family that spans the globe. 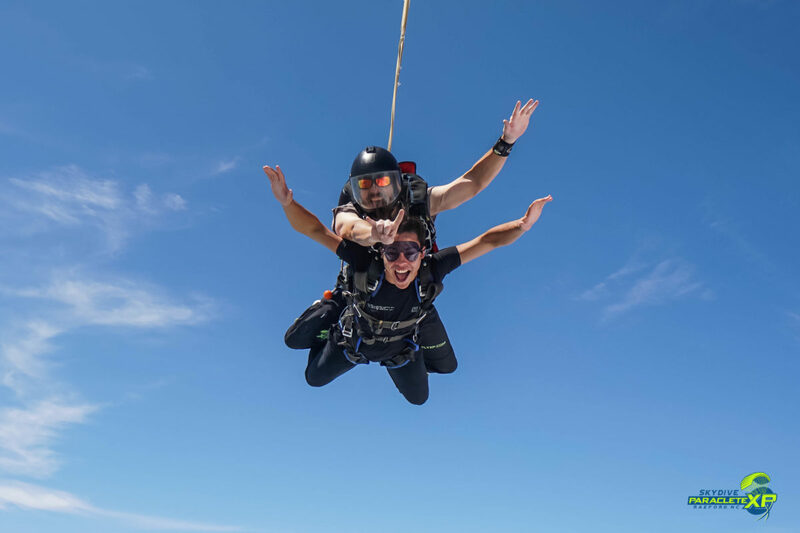 When you’re ready to jump for the first time, if you’re keen to learn how to skydive solo or if you’re looking for a place to hone your skills, come fly with us at Skydive Paraclete XP. Adventure is calling; get after it.